Welcome to Chapter 5 of the “Implementing a language with LLVM” tutorial. Parts 1-4 described the implementation of the simple Kaleidoscope language and included support for generating LLVM IR, followed by optimizations and a JIT compiler. Unfortunately, as presented, Kaleidoscope is mostly useless: it has no control flow other than call and return. This means that you can’t have conditional branches in the code, significantly limiting its power. In this episode of “build that compiler”, we’ll extend Kaleidoscope to have an if/then/else expression plus a simple ‘for’ loop. Extending Kaleidoscope to support if/then/else is quite straightforward. It basically requires adding support for this “new” concept to the lexer, parser, AST, and LLVM code emitter. This example is nice, because it shows how easy it is to “grow” a language over time, incrementally extending it as new ideas are discovered. In Kaleidoscope, every construct is an expression: there are no statements. As such, the if/then/else expression needs to return a value like any other. Since we’re using a mostly functional form, we’ll have it evaluate its conditional, then return the ‘then’ or ‘else’ value based on how the condition was resolved. This is very similar to the C “? :” expression. The semantics of the if/then/else expression is that it evaluates the condition to a boolean equality value: 0.0 is considered to be false and everything else is considered to be true. If the condition is true, the first subexpression is evaluated and returned, if the condition is false, the second subexpression is evaluated and returned. Since Kaleidoscope allows side-effects, this behavior is important to nail down. Now that we know what we “want”, let’s break this down into its constituent pieces. /// IfExprAST - Expression class for if/then/else. The AST node just has pointers to the various subexpressions. getNextToken();  // eat the if. Now that we have it parsing and building the AST, the final piece is adding LLVM code generation support. This is the most interesting part of the if/then/else example, because this is where it starts to introduce new concepts. All of the code above has been thoroughly described in previous chapters. Another way to get this is to call “F->viewCFG()” or “F->viewCFGOnly()” (where F is a “Function*”) either by inserting actual calls into the code and recompiling or by calling these in the debugger. LLVM has many nice features for visualizing various graphs. 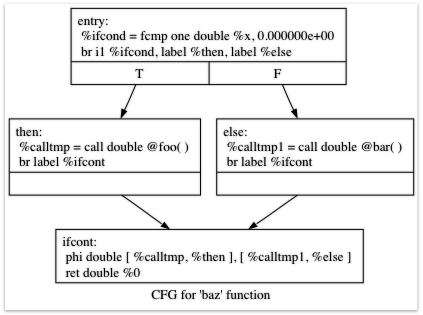 Getting back to the generated code, it is fairly simple: the entry block evaluates the conditional expression (“x” in our case here) and compares the result to 0.0 with the “fcmp one” instruction (‘one’ is “Ordered and Not Equal”). Based on the result of this expression, the code jumps to either the “then” or “else” blocks, which contain the expressions for the true/false cases. Once the then/else blocks are finished executing, they both branch back to the ‘ifcont’ block to execute the code that happens after the if/then/else. In this case the only thing left to do is to return to the caller of the function. The question then becomes: how does the code know which expression to return? The answer to this question involves an important SSA operation: the Phi operation. If you’re not familiar with SSA, the wikipedia article is a good introduction and there are various other introductions to it available on your favorite search engine. The short version is that “execution” of the Phi operation requires “remembering” which block control came from. The Phi operation takes on the value corresponding to the input control block. In this case, if control comes in from the “then” block, it gets the value of “calltmp”. If control comes from the “else” block, it gets the value of “calltmp1”. Values that are implicit in the structure of your AST, such as the Phi node in this case. In Chapter 7 of this tutorial (“mutable variables”), we’ll talk about #1 in depth. For now, just believe me that you don’t need SSA construction to handle this case. For #2, you have the choice of using the techniques that we will describe for #1, or you can insert Phi nodes directly, if convenient. In this case, it is really easy to generate the Phi node, so we choose to do it directly. Okay, enough of the motivation and overview, let’s generate code! // Convert condition to a bool by comparing non-equal to 0.0. This code is straightforward and similar to what we saw before. We emit the expression for the condition, then compare that value to zero to get a truth value as a 1-bit (bool) value. // end of the function. This code creates the basic blocks that are related to the if/then/else statement, and correspond directly to the blocks in the example above. The first line gets the current Function object that is being built. It gets this by asking the builder for the current BasicBlock, and asking that block for its “parent” (the function it is currently embedded into). Once it has that, it creates three blocks. Note that it passes “TheFunction” into the constructor for the “then” block. This causes the constructor to automatically insert the new block into the end of the specified function. The other two blocks are created, but aren’t yet inserted into the function. Once the blocks are created, we can emit the conditional branch that chooses between them. Note that creating new blocks does not implicitly affect the IRBuilder, so it is still inserting into the block that the condition went into. Also note that it is creating a branch to the “then” block and the “else” block, even though the “else” block isn’t inserted into the function yet. This is all ok: it is the standard way that LLVM supports forward references. // Codegen of 'Then' can change the current block, update ThenBB for the PHI. Once the insertion point is set, we recursively codegen the “then” expression from the AST. To finish off the “then” block, we create an unconditional branch to the merge block. One interesting (and very important) aspect of the LLVM IR is that it requires all basic blocks to be “terminated” with a control flow instruction such as return or branch. This means that all control flow, including fall throughs must be made explicit in the LLVM IR. If you violate this rule, the verifier will emit an error. The final line here is quite subtle, but is very important. The basic issue is that when we create the Phi node in the merge block, we need to set up the block/value pairs that indicate how the Phi will work. Importantly, the Phi node expects to have an entry for each predecessor of the block in the CFG. Why then, are we getting the current block when we just set it to ThenBB 5 lines above? The problem is that the “Then” expression may actually itself change the block that the Builder is emitting into if, for example, it contains a nested “if/then/else” expression. Because calling codegen() recursively could arbitrarily change the notion of the current block, we are required to get an up-to-date value for code that will set up the Phi node. // codegen of 'Else' can change the current block, update ElseBB for the PHI. The first two lines here are now familiar: the first adds the “merge” block to the Function object (it was previously floating, like the else block above). The second changes the insertion point so that newly created code will go into the “merge” block. Once that is done, we need to create the PHI node and set up the block/value pairs for the PHI. Finally, the CodeGen function returns the phi node as the value computed by the if/then/else expression. In our example above, this returned value will feed into the code for the top-level function, which will create the return instruction. This expression defines a new variable (“i” in this case) which iterates from a starting value, while the condition (“i < n” in this case) is true, incrementing by an optional step value (“1.0” in this case). If the step value is omitted, it defaults to 1.0. While the loop is true, it executes its body expression. Because we don’t have anything better to return, we’ll just define the loop as always returning 0.0. In the future when we have mutable variables, it will get more useful. As before, let’s talk about the changes that we need to Kaleidoscope to support this. The AST node is just as simple. It basically boils down to capturing the variable name and the constituent expressions in the node. /// ForExprAST - Expression class for for/in. getNextToken();  // eat the for. // The step value is optional. This loop contains all the same constructs we saw before: a phi node, several expressions, and some basic blocks. Let’s see how this fits together. // Emit the start code first, without 'variable' in scope. With this out of the way, the next step is to set up the LLVM basic block for the start of the loop body. In the case above, the whole loop body is one block, but remember that the body code itself could consist of multiple blocks (e.g. if it contains an if/then/else or a for/in expression). // Insert an explicit fall through from the current block to the LoopBB. This code is similar to what we saw for if/then/else. Because we will need it to create the Phi node, we remember the block that falls through into the loop. Once we have that, we create the actual block that starts the loop and create an unconditional branch for the fall-through between the two blocks. // Start insertion in LoopBB. // Start the PHI node with an entry for Start. Now that the “preheader” for the loop is set up, we switch to emitting code for the loop body. To begin with, we move the insertion point and create the PHI node for the loop induction variable. Since we already know the incoming value for the starting value, we add it to the Phi node. Note that the Phi will eventually get a second value for the backedge, but we can’t set it up yet (because it doesn’t exist!). // shadows an existing variable, we have to restore it, so save it now. Now the code starts to get more interesting. Our ‘for’ loop introduces a new variable to the symbol table. This means that our symbol table can now contain either function arguments or loop variables. To handle this, before we codegen the body of the loop, we add the loop variable as the current value for its name. Note that it is possible that there is a variable of the same name in the outer scope. It would be easy to make this an error (emit an error and return null if there is already an entry for VarName) but we choose to allow shadowing of variables. In order to handle this correctly, we remember the Value that we are potentially shadowing in OldVal (which will be null if there is no shadowed variable). Once the loop variable is set into the symbol table, the code recursively codegen’s the body. This allows the body to use the loop variable: any references to it will naturally find it in the symbol table. // Emit the step value. // If not specified, use 1.0. Now that the body is emitted, we compute the next value of the iteration variable by adding the step value, or 1.0 if it isn’t present. ‘NextVar’ will be the value of the loop variable on the next iteration of the loop. // Compute the end condition. Finally, we evaluate the exit value of the loop, to determine whether the loop should exit. This mirrors the condition evaluation for the if/then/else statement. // Create the "after loop" block and insert it. // Insert the conditional branch into the end of LoopEndBB. // Any new code will be inserted in AfterBB. With the code for the body of the loop complete, we just need to finish up the control flow for it. This code remembers the end block (for the phi node), then creates the block for the loop exit (“afterloop”). Based on the value of the exit condition, it creates a conditional branch that chooses between executing the loop again and exiting the loop. Any future code is emitted in the “afterloop” block, so it sets the insertion position to it. // Add a new entry to the PHI node for the backedge. // Restore the unshadowed variable. // for expr always returns 0.0. The final code handles various cleanups: now that we have the “NextVar” value, we can add the incoming value to the loop PHI node. After that, we remove the loop variable from the symbol table, so that it isn’t in scope after the for loop. Finally, code generation of the for loop always returns 0.0, so that is what we return from ForExprAST::codegen(). With this, we conclude the “adding control flow to Kaleidoscope” chapter of the tutorial. In this chapter we added two control flow constructs, and used them to motivate a couple of aspects of the LLVM IR that are important for front-end implementors to know. In the next chapter of our saga, we will get a bit crazier and add user-defined operators to our poor innocent language. // of these for known things. /// gettok - Return the next token from standard input. // Comment until end of line. // Check for end of file. Don't eat the EOF. // Otherwise, just return the character as its ascii value. /// ExprAST - Base class for all expression nodes. /// NumberExprAST - Expression class for numeric literals like "1.0". /// VariableExprAST - Expression class for referencing a variable, like "a". /// BinaryExprAST - Expression class for a binary operator. /// CallExprAST - Expression class for function calls. /// of arguments the function takes). /// lexer and updates CurTok with its results. /// GetTokPrecedence - Get the precedence of the pending binary operator token. // Make sure it's a declared binop. /// LogError* - These are little helper functions for error handling. if (CurTok != '(') // Simple variable ref. getNextToken(); // eat the if. getNextToken(); // eat the for. // If this is a binop, find its precedence. // consume it, otherwise we are done. // Okay, we know this is a binop. // Parse the primary expression after the binary operator. // the pending operator take RHS as its LHS. // Make an anonymous proto. // First, see if the function has already been added to the current module. // If no existing prototype exists, return null. // Look this variable up in the function. // Look up the name in the global module table. // If argument mismatch error. // Make the function type:  double(double,double) etc. // Set names for all arguments. // reference to it for use below. // Create a new basic block to start insertion into. // Record the function arguments in the NamedValues map. // Finish off the function. // Validate the generated code, checking for consistency. // Run the optimizer on the function. // Error reading body, remove function. // Open a new module. // Create a new pass manager attached to it. // Skip token for error recovery. // Evaluate a top-level expression into an anonymous function. // we can free it later. // Search the JIT for the __anon_expr symbol. // arguments, returns a double) so we can call it as a native function. // Delete the anonymous expression module from the JIT. case ';': // ignore top-level semicolons. // "Library" functions that can be "extern'd" from user code. /// putchard - putchar that takes a double and returns 0. /// printd - printf that takes a double prints it as "%f\n", returning 0. // Install standard binary operators. // 1 is lowest precedence. BinopPrecedence['*'] = 40; // highest.